AdBanner Remover Plus is a tool to remove advertisements on Yahoo Messenger application, so it’ll give you more space. By removing those ads on your Yahoo Messenger, your login and loading process will be more light and fast. Besides removing ads on YM application, this software can also be used for Multi Login ID (Multi YM). So that we can have more than one Yahoo Messenger Application running on our PC, and then login with more than one ID. 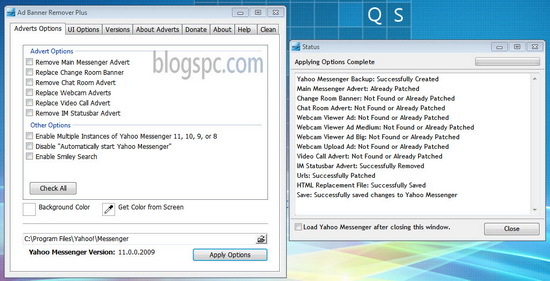 The latest version of this AdBanner Remover Plus 1.0.4.9 works for all Yahoo Messenger version begin from YM9, YM10, and also the latest version of Yahoo Messenger (YM 11.0.0.2009). After you configured this software on you Yahoo Messenger, but then you want to reset all the configuration into the basic YM configuration you have earlier, you’re be able to do so with this software. For Windows Vista and Windows Seven users, you have to run this program as the administrator, as you can do this by choosing “Run as Administrator” on your right-click option.